Imagine you’re an undocumented Hispanic immigrant working in a factory. One day, you get badly injured on the job and can no longer work to support your family. Do you have legal rights to compensation? Would you even try to find a legal remedy? Or would you be too worried about being deported? 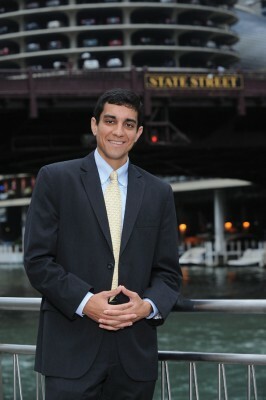 Raul Rodriguez is an associate attorney at Goldberg Weisman Cairo. He also works through the Mexican Consulate in Chicago to provide free legal advice to immigrants who are injured on the job. “The individuals who seek out the consulate often already have representation,” he says, but sometimes language barriers prevent them from understanding their lawyer’s counsel. Rodriguez takes a look at each individual’s documentation and explains the process. Sometimes he comes across a person without representation who needs help, and if the consulate workers think they can help, they take the case. While his work at the Mexican Consulate focuses on workplace injuries, Rodriguez notes that other attorneys are available to help with legal problems such as wage, immigration, and criminal issues. One of the biggest challenges he faces at the consulate is getting clients to seek help, especially if they’re undocumented. “They have to realize there are people here to help—and seeking our help won’t threaten their status. They won’t get deported,” he says. The consulate does a good job of spreading the message that it’s a safe haven. Another big challenge is helping clients understand how to navigate the legal system. Rodriguez counsels workers to follow specific steps if they are injured: report it, get medical attention, and find witnesses. In 2008, the Mexican Consulate in Chicago noticed that Hispanic workers knew little about their rights, so a few individuals at the consulate started Labor Rights Week (LRW) in 2009 to educate workers. From that small beginning, the concept quickly spread. By 2010, all of the Mexican consulates in the United States had mandated Labor Rights Weeks. Now the consulates of Guatemala and El Salvador in Chicago also sponsor Labor Rights Weeks. As an active participant in LRW, Rodriguez sees firsthand the program’s success disseminating information to workers about their rights. One week in August each year, consulate workers go to working-class Latino neighborhoods in northern Illinois and conduct workshops and events on workers’ rights. Some events host only five or 10 people while others see more than 100. State and federal agencies (the Illinois Office of the State’s Attorney, Occupational Safety and Health Administration, and the National Labor Relations Board) are also involved. Community organizers, such as church leaders, play a big role in increasing attendance.